Read more about supported standards, technologies and platforms. The ad can be displayed before (pre-roll), after (post-roll) and during (mid-roll) the main video requested by the resource user, or when they click "Pause" (pause-roll). 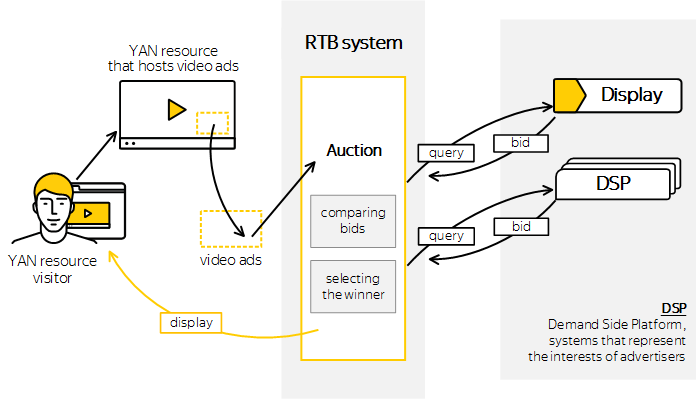 InStream uses Real-Time Bidding (RTB) technology. Real-Time Bidding is a technology used to sell and buy ad impressions based on real-time auctions. RTB lets you maximize revenue from ad impressions, as the most profitable ad is automatically chosen out of all advertisers' ads. How cost per impression is determined for video ads. How to create an InStream video block using our visual ad code designer. The InStream settings available for video blocks.